Hey! Do you have a friend that is vegetarian or vegan, but you're not...so what do you do? Don't fret, this recipe is not only healthy, good looking and easy, it's the perfect fit if you're wanting to impress your veggie loving friends. Or, even if you just need some plant food inspo! I gotchuuuu. I was inspired to experiment with cauliflower after my friend Chantal (nutty4nutrition) literally started putting cauliflower puree into almost everything. While this method of enjoying cauliflower isn't pureed, it's definitely a crowd pleaser and you can easily make this your own. The first step is to pick the perfect cauliflower head - you want something that is medium to large in size so you can get about 2 - 4 "steaks" out of it. If you choose ones of those itty bitty cute cauliflowers you might end up with a bouquet of cute florets. Which...isn't a badddd thing either. Then, start thinking about what flavour profile you want. For mine, I added Indian spices like cumin and garam masala. You could easily adapt the herbs - I've done variations with parsley, oregano and basil and I've also sprinkled nutritional yeast for a cheesy flavour. What's next? Sear it, bake it, eat it! EASY PEASY. In a small bowl mix oil, garam masala, cumin, turmeric and garlic. Add in salt and pepper. Set cauliflower on a sturdy surface, stem side up. Cut cauliflower in half, vertically, through the center of the stem (the stem helps keep the steak intact). Starting from the flat side of each half, measure in 1-inch and slice down vertically creating a 1-inch thick “steak”. Save exterior section (which will likely fall apart because there is no stem to hold it together) for salads, to make cauliflower rice to enjoy as florets. Heat a large, heavy oven-proof skillet over medium heat. Drizzle cauliflower with spiced oil and rub all over on both sides. Cook until the bottom side is a nutty brown color but not burnt, about 8 - 10 minutes. Flip steaks and transfer skillet to oven. Bake for 15 minutes, or until cauliflower is tender throughout and the bottom is browned. 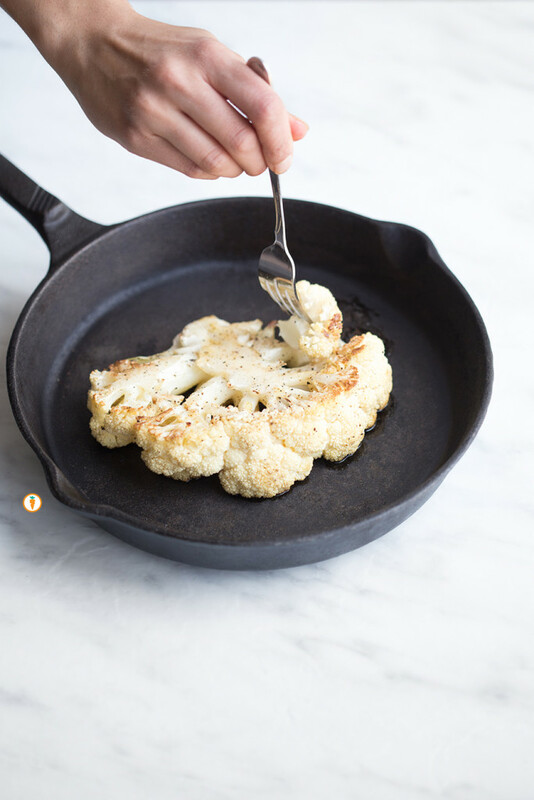 Remove cauliflower from the oven, serve as is or with a drizzle of yogurt if you wish. I also enjoy garnishing mine with cilantro.